Facial hair growth is like a thumb print - no one's grows exactly the same. Knowing how your beard grows enables you to get the best possible shave. When starting out, there is a generic ‘order’ in which you can attempt to make your passes. This helps if you’re just getting started and a bit unsure where to begin. Once you develop an understanding of the growth of your hair, you will develop what suits best for you. The numbers state which order and the arrows depict what direction to shave in. A "pass" refers to a shave that covers each bewhiskered part of the face and neck once. A shaver may make more than one pass when shaving. A pass may be with the direction that the hairs grow ("with the grain," or WTG), across the direction of hair growth ("across the grain," or XTG), or against the direction of hair growth ("against the grain," or ATG). If only part of the face is shaved, this is a "partial pass." A shaver may, for example, make a "partial ATG pass" on a troublesome part of the neck. Of course, one may speak casually of a "pass" when a partial pass is meant: "This morning I shaved WTG and XTG, then took a ATG pass at my upper lip and got it BBS!" Hair growth and attack angles. If possible, stretch the skin in the opposite direction to which you’re shaving. This first diagram shows stroke directions with the grain. This diagram shows stroke directions against the grain. "WTG" is an abbreviation that stands for "with the grain." It refers to a shaving pass in which one shaves in the same direction that the hair grows. A WTG pass can be compared with a pass that is XTG ("across the grain" or direction of hair growth) or ATG ("against the grain" or direction of hair growth). "XTG" is an abbreviation that stands for "across the grain." It refers to a shaving pass in which one shaves in a direction perpendicular to that in which the hair grows. For example, if the hair grows "north-to-south," then an XTG pass may shave "east-to-west" or "west-to-east." An XTG pass can be compared with a pass that is WTG ("with the grain" or direction of hair growth) or ATG ("against the grain" or direction of hair growth). "ATG" is an abbreviation that stands for "against the grain." It refers to a shaving pass in which one shaves in a direction opposite that in which the hair grows. For example, if the hair grows "north-to-south," then an ATG pass will shave "south-to-north." An ATG pass can be compared with a pass that is WTG ("with the grain" or direction of hair growth) or XTG ("across the grain" or direction of hair growth). Different kinds of passes are commonly combined into a multiple pass shaving technique. Shaving different kinds of passes comfortably can demand a finer understanding of cutting angles. The easiest way to move a razor over the skin, is to guide it in a direction, perpendicular to the edge. As a result the razor “chops” the hairs, much like an axe chops a young branch off a tree, with one blow. Out of a physical viewpoint this way of severing something requires the most force and is the hardest on the cutting edge. By adding a slight rotating motion to the blade, the cutting action becomes more effective. For ages, farmers have been harvesting wheat with this very effective style of cutting with a tool called scythe. Adding a little scything style to the razor will allow a smoother cut, helps the longevity of the edge, prevents pull, helps to prevent the blade form being stopped by stubborn whiskers, and might do more for your shaves’ closeness than boosting the actual keenness of the blade. A word of caution: scything in combination with a too steep cutting angle, is a perfect recipe for slicing into the skin. In guillotine style cutting, the edge is held a bit angled in relation to the cutting motion. For some shaving strokes it is easier to perform than the scythe itself. 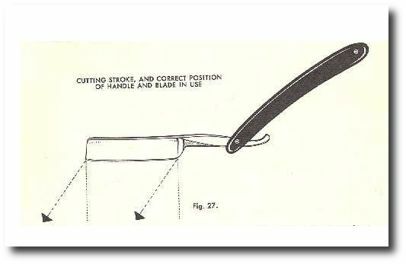 Slicing is occasionally used to refer to the guillotine style cutting stroke, but is more often used to describe what happens when the razor slides across the face in the direction of the edge of the blade. Such a slicing stroke with a shave ready razor will easily cut the skin and is not considered a shaving stroke. Whiskers rarely grow straight up. They grow ordered in streams where the hairs lean in the same direction towards the skin. We call this: the grain. Most shavers shave in passes. First with the grain (WTG), usually followed by subsequent passes across (XTG) and/or against (ATG) the grain. This is considered basic shaving knowledge. Together with the direction at which the hairs are tackled, the used cutting angle is one of the most contributing factors to a successful shave. The cutting angle is the enclosed angle between the surface of the skin and the razor (cf. the drawing below). Different cutting angles are required to maximize the results of the different passes. The WTG pass requires a bigger angle, because otherwise the razor will not immediately grab the hairs. The XTG and more importantly the ATG pass ask for a notably smaller angle. Certainly during the ATG pass, if you are blessed with whiskers that lay almost flat to the skin, the spine of the razor may be as good as touching the skin. The way the skin is stretched also affects how the hairs stand up in relation to the skin’s surface. We will address this in a separate paragraph. Stretching the skin with the direction of the hair growth, causes the whiskers to lay down more. Stretching the skin against the direction of the hair growth, causes the whiskers to stand up more. This can be put to our advantage during the shave. Certainly during the ATG pass, stretching the skin closely in front of the edge, although a bit intimidating at first, can really improve closeness for those gentleman that posses hairs that grow very close to the skin. Another important tactic for closely shaving hard to get spots, is to pull that part of the skin to an area where it can be shaved more successfully. Especially with patches above and below the cheekbones and chin, this is a valuable option. This is a technique, mainly to be used during the ATG pass. 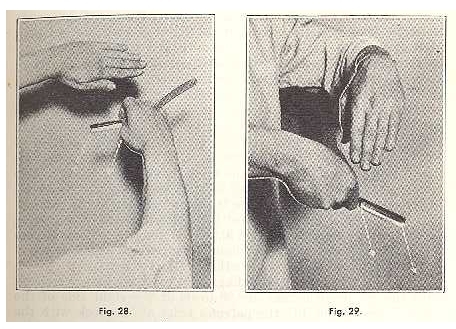 The blade is moved back and forth in short strokes over the skin, without lifting it. Pressure needs to be extremely low. The first part of the stroke cuts the hairs and the second, withdrawing part of the stroke smears an amount of lather back on the skin, preparing for the next stroke that will cut the hair even closer. This is only useful on dense parts of the beard where thick whiskers require more than one stroke to be gradually cut till the "zero"-level. The sound produced by the razor (if it’s a hollow ground one) will guide you through the process, steadily moving ahead while making short overlapping strokes. It is best reserved as a last resort, to achieve ultimate smoothness on renitent spots. This page was last edited on 25 June 2011, at 09:33.